Item description: In his diary, Jesse Bernard describes correspondence he received from his family in Virginia who experienced Union siege. He expresses his faith in Confederate forces to eject the the Union forces from southern soil. Item Citation: From folder 3 of the Overton and Jesse Bernard Diaries #62-z, Southern Historical Collection, Wilson Library, University of North Carolina at Chapel Hill. Friday afternoon, 14th. How time flies. It does not seem as though six weeks had passed since my sisters left here for Va. and yet it is even so. We hear from them regularly. They are in the midst of armed camps and feel secure from an attack from the enemy. Hampton has been taken, as well as Newport News and the enemy have been committing sad havoc, in destroying the growing crops in the vicinity. But this is not all even poor defenseless women is insulted. Their day of reckoning will soon come however. President Davis, Beauregard, Lee and the two Johnsons are all now in Virginia; tens of thousands of brave soldiers have come from afar to assist, and soon the vandal foe will be driven from the borders of the “Old Dominion”. Hitherto, we have retreated, but now we will advance, and not only drive the enemy from our shores, but carry it into his own country. So our President Mr. Davis has said, and those whoe know him, find him to be a man of his word. As 2500 troops recently stationed at Pensacola have left for Va. and as Gov. Letcher has called out all the available militia force of the state, we have every reason to believe that a fierce and bloody conflict will soon be at hand. Yesterday was a day appointed by President Davis, to be observed as a day of fasting and prayer. Religious service was doubtless held in all the Churches, and while Christians fasted we trust that they prayed earnestly for God’s blessing on His Church as well as our country. May He bless both and let piety and liberty be ours. Today it has been raining all day, and I have kept in doors. I do not miss the papers as much as I thought I would, but have just enough to interest me, and have more time to devote to my legal studies than I have had heretofore. 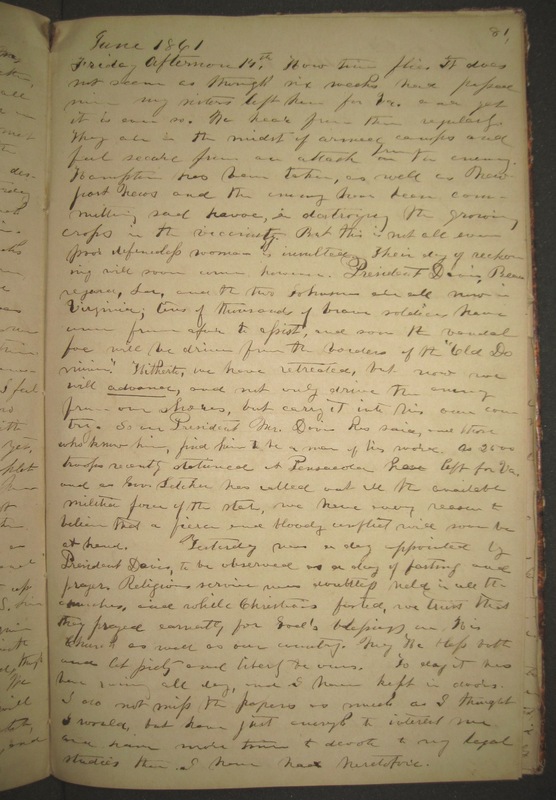 About Jesse Bernard: Jesse Bernard, lawyer of Alachua County, Fla., kept his diary sporadically from 1856 to 1891. It contains entries relating to local religious affairs, lawyering, visits to Virginia, and the Civil War. This entry was posted in Southern Historical Collection and tagged day of fasting and prayer, Jesse Bernard, Union occupation, Virginia. Bookmark the permalink.